You can use the tokens received in-game or purchased from PS™Store in the Lottery to randomly acquire Mobile Suits, Main Weapons, etc. 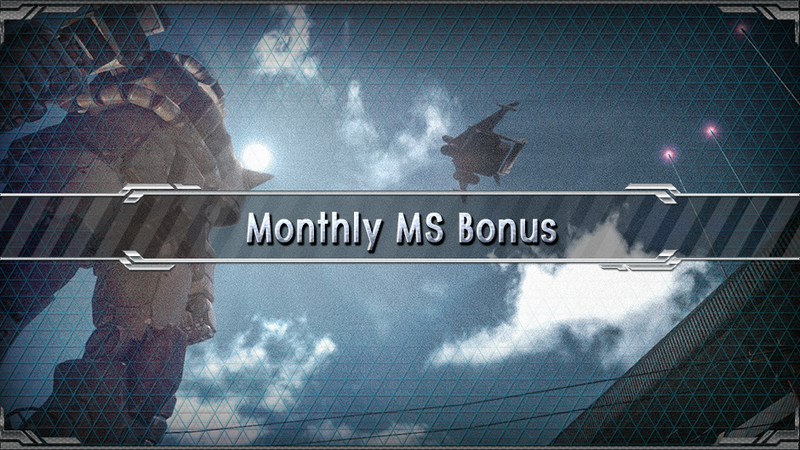 What is the Monthly MS Bonus? If you have a unit selected for the Monthly MS Bonus event, your Rewards will increase depending on the amount of units that are in your possession. *Each draw rate will be round off to the fourth decimal place. The total value may not be 100%. *Items with a boost to lottery rates have the same draw rate, while items with the same rarity will also have the same draw rate. For more details about an item with a boost to lottery rates, please check the Lottery List’s Remarks column. *Items with a boost to lottery rates may be drawn due to the item’s rarity. *Duplicate items may appear during the lottery. Duplicate items will be automatically exchanged for Recycle Tickets. *The draw rate during a 10-draw will change with each lottery request. Please see below for each draw rate. *Once all Steps in the lottery have been requested, the lottery cannot be used again. *A ★★★ MS is guaranteed during one of the lottery attempts in the STEP3 10-draw. Please see the “★★★ MS guaranteed (once in a 10-draw)” for the draw rate. *Please see the “Regular (9 times in a 10-draw)” to confirm the draw rate other than “★★★ MS guaranteed (once in a 10-draw)”. *For information such as about promotion events, please check the latest news.